Figure 1: Computational analysis of drop formation and detachment for low viscosity fluids, simulated using FLOW-3D: (a) Time evolution of scaled neck radius is shown on a semi-log plot for five low viscosity fluids. The time axis is shifted to show how neck radius evolves from right to left. Likewise, the snapshots show decrease in neck radius from right to left. The use of a color-map for the magnitude of velocity (units: cm/s) and arrows for its direction, allows us to determine the deformation field, and for Fluid 5 (see Table 1), it becomes purely extensional beyond the instant captured in image II. Highly conical neck formed before pinch-off is similar to the neck shape obtained using experiments. Simulations of drop formation and detachment from a nozzle were performed using uniform mesh size in FLOW-3D by using the Surface Tension and Gravity models. Drop formation and detachment of a finite volume of fluid involves the interplay of capillarity, inertia, viscosity and gravitational-induced drainage within a neck that connects a pendant growing drop to a nozzle. In the simulation, a finite volume of a Newtonian fluid is issued from a stainless steel nozzle ( ). Detachment of a newly formed drop occurs once the gravitational force overcomes surface tension force ( ). Simulations are divided into two groups to elucidate the dramatic influence of fluid viscosity: low viscosity fluids (e.g., water and glycerol/water mixtures with glycerol content <40% by weight) and high viscosity fluids (e.g. glycerol and glycerol/water mixtures with shear viscosity > 100x Water Viscosity). Properties of the fluids of both groups are listed in Table 1 and 2, respectively. Figure 2: Computational analysis of drop formation and detachment for high viscosity fluids, simulated using FLOW-3D: Time evolution of scaled radius is shown for four high viscosity Newtonian fluids on a semi-log plot, such that the pinch-off is approached from right to left. Snapshots of capillary-driven thinning during drop detachment are shown. The color-map captures the variation in velocity magnitude (units: cm/s) for Fluid 8 (see Table 2). The arrows depict the direction of flow field within the growing drop and thinning neck. The neck shape obtained from FLOW-3D simulations lead to the slender cylindrical fluid elements that are characteristic for high viscosity Newtonian fluids. Simulation of low viscosity fluid (Fluid 2 in Table 1) dripping from a nozzle. Color variable is the velocity magnitude (units: cm/s) and velocity vectors are shown. Simulation of high viscosity fluid (Fluid 8 in Table 2) dripping from a nozzle. Color variable is the velocity magnitude (units: cm/s) and velocity vectors are shown. We find that the measured values of capillary velocity (ratio of surface tension and viscosity) are comparable to the values obtained using commercially-available instrument called Capillary Break-up Extensional Rheometer (CaBER) by McKinley and Tripathi (8), and to the capillary velocity computed using their nominal surface tension and viscosity. FLOW-3D allows for visualization of velocity vectors in the neck during thinning which gives insight into a nature of the flow. In addition, it gives the possibility of determining the moment during thinning after which the flow field within the thinning neck after initially experiencing a combination of shear and extension becomes purely extensional as shown in Figure 1. 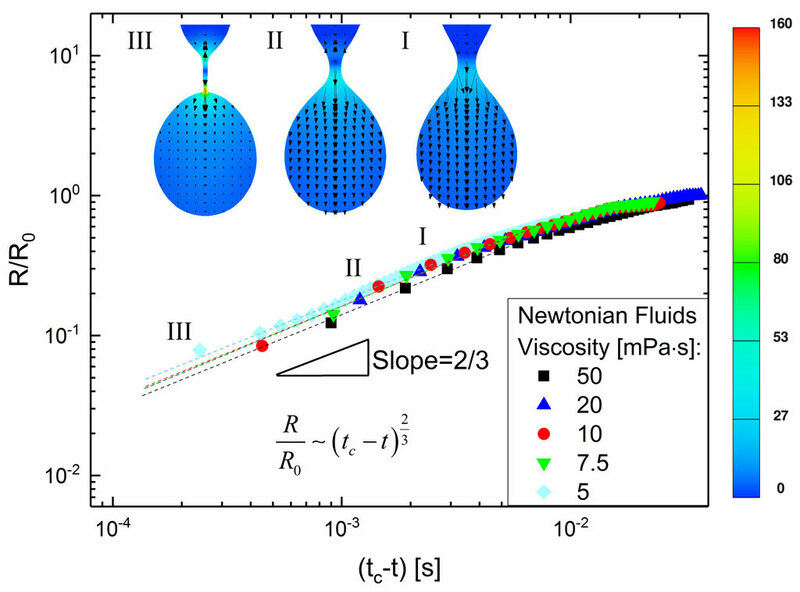 Additionally, thinning dynamics of low viscosity fluids show a qualitatively different behavior compared to high viscosity Newtonian fluids (see Figure 2). The neck profile for a low viscosity Newtonian fluid, becomes self-similar in agreement with theory (6, 13), in frames leading to the pinch-off. Our preliminary results show that FLOW-3D based computational analysis can be used for simulating prototypical free-surface flows underlying drop formation and detachment. We find that the simulated radius evolution profiles match the scaling laws and pinch-off dynamics that are experimentally-observed and theoretically-predicted for inviscid fluids as well as high viscosity Newtonian fluids. In contrast with often-used 1D or 2D models, FLOW-3D allows a robust evaluation of the magnitude of the underlying stresses and extensional flow field (both uniformity and magnitude) and the visualization of the flow filed within the thinning liquid filament (see Figure 1 and 2, for example). Stream-wise velocity gradients associated with extensional flow field arise within the columnar necks undergoing capillary-driven thinning. In rheologically-complex fluids, extra elastic stresses as well as non-Newtonian shear and extensional viscosity dramatically alter the nonlinear pinch-off dynamics (2, 10-12). We are currently implementing constitutive models with viscoelasticity and non-Newtonian rheology into FLOW-3D to develop robust computational protocols for assessing processability of complex fluids. J. Eggers, Nonlinear dynamics and breakup of free-surface flows. Rev. Mod. Phys. 69, 865-929 (1997). G. H. McKinley, Visco-elasto-capillary thinning and break-up of complex fluids. Rheology Reviews, 1-48 (2005). B. Derby, Inkjet Printing of Functional and Structural Materials: Fluid Property Requirements, Feature Stability, and Resolution. Annual Review of Materials Research 40, 395-414 (2010). O. A. Basaran, H. Gao, P. P. Bhat, Nonstandard Inkjets. Annual Review of Fluid Mechanics 45, 85-113 (2013). S. Kumar, Liquid Transfer in Printing Processes: Liquid Bridges with Moving Contact Lines. Annual Review of Fluid Mechanics 47, 67-94 (2014). R. F. Day, E. J. Hinch, J. R. Lister, Self-similar capillary pinchoff of an inviscid fluid. Phys. Rev. Lett. 80, 704-707 (1998). J. Eggers, M. A. Fontelos, Singularities: Formation, Structure, and Propagation. (Cambridge University Press, Cambridge, UK, 2015), vol. 53. G. H. McKinley, A. Tripathi, How to extract the Newtonian viscosity from capillary breakup measurements in a filament rheometer. J. Rheol. 44, 653-670 (2000). D. T. Papageorgiou, On the breakup of viscous liquid threads. Phys. Fluids 7, 1529-1544 (1995). J. Dinic, L. N. Jimenez, V. Sharma, Pinch-off dynamics and dripping-onto-substrate (DoS) rheometry of complex fluids. Lab on a Chip 17, 460-473 (2017). J. Dinic, Y. Zhang, L. N. Jimenez, V. Sharma, Extensional Relaxation Times of Dilute, Aqueous Polymer Solutions. ACS Macro Letters 4, 804-808 (2015). V. Sharma et al., The rheology of aqueous solutions of Ethyl Hydroxy-Ethyl Cellulose (EHEC) and its hydrophobically modified Analogue (hmEHEC): Extensional flow response in capillary break-up, jetting (ROJER) and in a cross-slot extensional rheometer. Soft Matter 11, 3251-3270 (2015). J. R. Castrejón-Pita et al., Plethora of transitions during breakup of liquid filaments. Proc. Natl. Acad. Sci. U.S.A. 112, 4582-4587 (2015).